Slideshow: Photos taken at the 2018 Visitor Public Safety Conference at the Sheraton Waikiki. The current influx of headliner news highlighting crimes taking place in our islands set the stage for our association, along with various public safety partners, to host the first ever Visitor Public Safety Conference. After months of planning, our efforts came to fruition this past Tuesday at the Sheraton Waikiki as members from all sectors of our community came together to share their mana’o in a free-flowing format that featured a lively question and answer exchange between panelists and the audience led by moderators Robert Cravalho, former HPD officer, Bulla Eastman from Aqua-Aston Hospitality, and Rick Egged of the Waikiki Improvement Association. The conference, co-chaired by HLTA President & CEO Mufi Hannemann and Honolulu City Council member Trevor Ozawa, was a success, with over 200 stakeholders in attendance including members from government, visitor industry affiliates, law enforcement, private businesses, the armed services, and the community. Members in attendance had the opportunity to hear from public safety leaders which included guest speakers Chief Susan Ballard of the Honolulu Police Department and Honolulu’s Prosecuting Attorney Keith Kaneshiro. Chief Ballard reiterated the strong focus that HPD is putting towards the continued safety of our visitors and residents and addressed the issue of barring cabaret licenses that operate till 4 a.m. in the Waikiki District. Prosecutor Kaneshiro spoke to the congestion in our courts system and how it consequently leads to a revolving door for criminals, and as a result posed a strong argument for the need for more prison space. The conference’s four featured panels each highlighted the problems that we currently face on the public safety front. Our first panel addressed law enforcement, which amongst topics on homelessness and drug trafficking really brought to light an issue plaguing our police department, prosecutor’s office, and businesses in Waikiki, and that is the lack of crimes being successfully reported. They really drove home the point, especially First Deputy Prosecutor Chasid Sapolu and HPD Acting Captain Eric Yosemori, that victims of crime need to be more willing to testify and prosecute. CLICK HERE TO READ THE FULL VISITOR PUBLIC SAFETY CONFERENCE STORY. On March 29, 2018, HLTA partnered with the Hawaii Hotel Visitor Industry Security Association in hosting a workshop addressing emergency management preparedness. This timely discussion covered pre- and post-preparedness plans that both the visitor industry and general public should be aware of in the case of a natural or man-made disaster. More than 100 members from HHVISA and HLTA from all over the state and officers from HPD filled the room yesterday at the Ohana Waikiki East Hotel to partake in the meeting. Before turning it to Jerry Dolak, Director of Security & Safety for Outrigger Hotels & Resorts and President of HHVISA to begin his presentation, HLTA President & CEO Mufi Hannemann summarized the findings of a survey that we sent to our members in the aftermath of the false missile alert. The energetic Dolak focused primarily on how properties can implement a business plan for a nuclear missile attack. He emphasized the point that a plan is only as good as those who read it and implement it. Therefore, we must ensure that our properties are equipped with a proper plan and that our industry employees know it well in advance. A few of his key takeaways include having a 14-day survival kit on hand at all times, implementing “Go Bags” which are duffels equipped with necessary supplements and tools, properly alerting guests and workers with a PA broadcast, and he advised that you should never pull a fire alarm as it will prompt panicked individuals to exit the shelter. Dolak also focused a substantial portion of his presentation on the importance of establishing a “safe haven” for each property. These designated shelters are ideally a basement or rooms surrounded by thick concrete or brick walls, and they should not be close to areas exposed to nuclear fallout such as rooftop or ground level floors. Those that are exposed to nuclear fallout need to first dispose of their clothes and wash off before entering any safe zones to prevent contamination; and those who are sheltering should wait at least 24 hours before leaving their quarantined area as radioactive fallout will need time to deteriorate. Jerry closed his segment by making his presentation and preparedness plan available to any interested parties. As I often say, “we’re all in this together”; this adage holds exceptionally true in the realm of public safety. CLICK HERE TO READ THE FULL EMERGENCY MANAGEMENT WORKSHOP STORY. 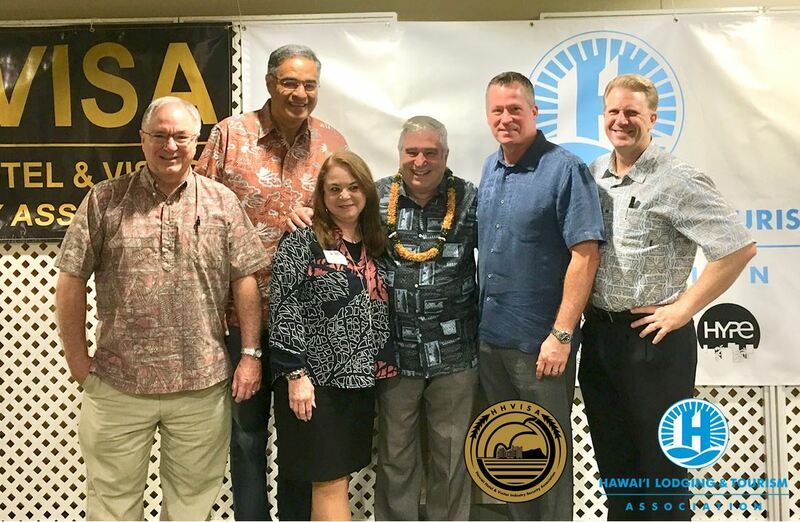 On October 17, 2017 HLTA partnered with the Hawaii Hotel & Visitor Security Association (HHVISA) and the Visitor Aloha Society of Hawaii (VASH) for a talk story session with Dr. Peter Tarlow, a world-renowned speaker and expert on tourism security. Dr. Tarlow specializes in the areas of crime and terrorism on the tourism industry, event and tourism risk management, and tourism and economic development, and has experience addressing agencies such as the US Center for Disease Control, The International Olympics Committee, The International Organization for Security and Intelligence, and The United Nation’s World Tourism Organization. HLTA President & CEO Mufi Hannemann has worked closely with Dr. Tarlow since the 1990’s, when he led the charge for the first ever Visitor Crime Solutions Conference as a response to the rash of negative incidents against Japanese tourists at that time. Government officials from Japan went public with their concerns. We could not afford to stand pat and risk being seen as being insensitive to visitor's safety in Hawaii. 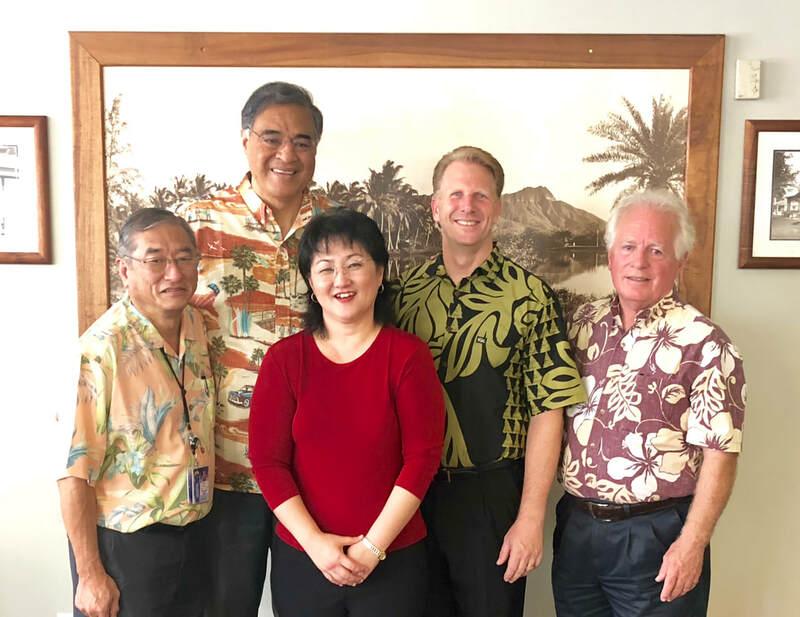 The conference was a partnership between government and the private sector, and helped to shed light and resolve some of the issues we were having in Waikiki and it went a long way towards assuaging our Japanese visitors that their safety was a high priority for us. The conference called for a number of improvements and initiatives that required HPD, county government and the visitor industry to collaborate for the good of the industry. "I believe it is high time we had another conference on tourism security in Hawaii, and am already making plans with HHVISA, VASH, Dr. Tarlow, and Waikiki district Councilmember Trevor Ozawa to make this a reality next year. As we all know the world we live in today is very different than it was in the 1990’s, and we must always be proactive when it comes to safety and security" said Mufi Hannemann. CLICK HERE TO READ THE FULL TOURISM SECURITY STORY. Bill 6 (2018): ​A BILL FOR AN ORDINANCE RELATING TO PUBLIC NUISANCES. In response to action items developed from our Visitor Public Safety Conference, WIA's executive director Rick Egged and Councilmember Trevor Ozawa have joined me in facilitating round table meetings with the Honolulu Police Department, and the independent “cabaret licensed” operators in Waikiki. Stakeholders attending our meetings included cabaret establishments, their property owners, HPD, WBIDA, WIA, the military, and Adult Friends for Youth. ​Through the sub-committee we are working towards reaching amicable solutions in keeping Waikiki safe for visitors and residents alike.​ ​Through our discussions we have put together a list of actionable items including, installing flood lights on Lewers Street, installing smart lighting in at risk areas, incorporating additional cameras, contracting “Special Duty” police officers to patrol late night hotspots, and contracting nonprofit “Adult Friends for Youth” to set up a headquarters in Waikiki to help identify and approach youth gangs.